Here is this week’s Highlights Email. If you are not getting it, send me your email address and I’ll add you. This Sunday we will worship God through the Lord’s Supper. As I get ready for it, I’m reading from Mark where it describes the way Jesus instituted the Lord’s Supper. He definitely included prayer as part of the meal and so should we. As you think about the Lord’s Supper come ready to get close to Christ, by remembering what he did for us, thanking him for it and celebrating – I mean really celebrating – his grace, mercy and generosity. For the last few weeks we’ve emphasized Prayer with our 30 days of prayer. Please continue to pray for our church every day. Starting next Sunday we will emphasize fellowship and reaching out to our members who have become inactive. Please also be praying for them. If you have someone that is a member of our church that God is giving you a burden to try to reach and bring back into the fellowship of our church, begin praying now for that person. We hope to start contacting these people in September and inviting them back. We will write invitation cards on Wednesdays as we do this. If you specifically want us to focus on a person you are praying for, let me know via email. Remember that we are hosting the Family Movie Night at Jacumin Plaza this week. Please come and get their early to help get things set up. The movie will start at 9:00 and we will start setting up at about 8:15. The men’s retreat will be Sep 30-Oct 1 and costs $35 per person if you stay overnight and $20 if you do not. We need the money this week to make our reservations. 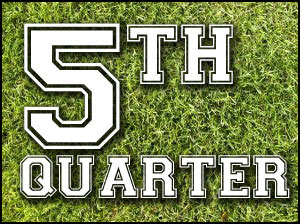 Starting Sep 23, the youth will host Fifth Quarter after the football games. This will continue throughout the season after this date starting about 9PM with food and devotions.